This is something I made last year for my customers when we played Bunco Stampin' Up! Style right before Thanksgiving...Seeing that Thanksgiving is next week - I thought I would share the idea again. 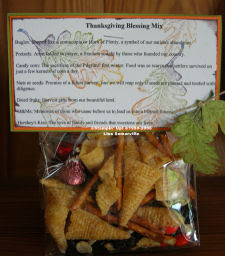 I used last years County Blessings Set - but a good substitute would be With Gratitude. Cool - I've never seen this before - thanks for sharing it!!! That looks great, the recipe looks yummy too. Thanks for the great idea. Lisa I love this. Thanks for sharing it again.